If you want longer or thicker hair, there's no better option than hair extensions. But with so many types of hair extensions, choosing the right one for your lifestyle and your bank account can be daunting. Below, we discuss six different kinds of extensions and their benefits and drawbacks. There are extensions that you can wear for a day and others that are meant to be worn for months. If you want to flirt with extensions or even bangs without making the full commitment, clip-in hair extensions are a great bet. You can buy hair wefts online and have your stylist color and cut them to match your natural hair. You can also buy clip-ins from salons. Clip-ins are worn by day and taken out at night. Placing them properly at the roots under the rest of your hair can take some practice. Hair wefts come in small sections, as bangs or long sections that run ear-to-ear. They are hairpieces with small toupee clips sewed on them, which are placed into hair that's been backcombed and hair sprayed so the clips stay in place. There are tutorials online that can help you place them. It can take some practice, but they can be hidden even if you have thin hair. These extensions won't damage your hair. You can wear them for special occasions or daily if you want. You can even try out bangs for a day or two. 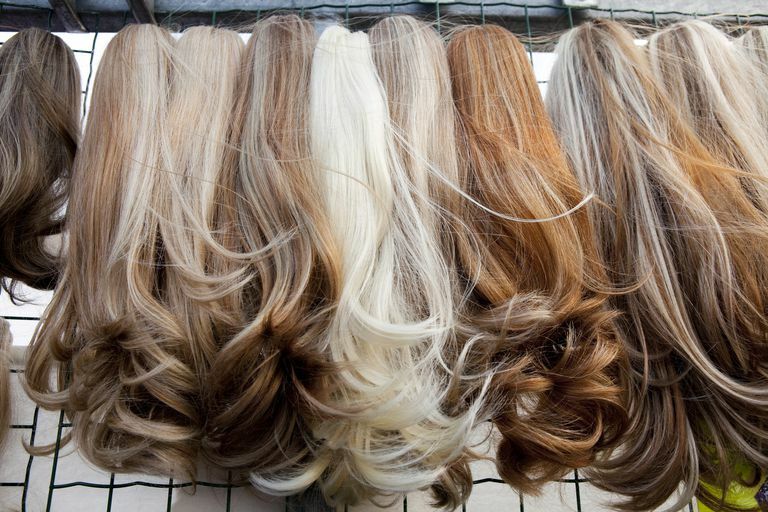 Synthetic extensions can look shiny and fake, so look for human hair extensions. Your stylist can cut them so they blend seamlessly with your own hair. Extensions range from $30 to $500, depending on the grams of hair and condition. Popular brands: Soft Waves Hair Extensions by Jessica Simpson, Dancing with the Stars Human Hair Clip-in Extensions and EasiHair Clip Extensions. Cashmere Hair Extensions are also a great choice but are expensive. Another temporary option for anyone who wants a more dramatic look but doesn't want to commit long-term are glue-in extensions. These are hairpieces secured to the hair with glue and removed with an oil-based solvent. These will stay in place better than clip-ins, and last for a few days. It can be expensive, costing over $500, so their best for a special event like a wedding. Bonded hair extensions are the most popular extensions. They also tend to be the most expensive option because a well-done job can last up to 5 months. You can choose between the more traditional hot fusion or the newer cold fusion technology for your extensions. With hot fusion, the stylist uses a mini flatiron to bond a glue-tipped extension to a section of hair. Cold fusion uses ultrasound waves and keratin polymers to attach the weave to hair. This is a less damaging approach and is particularly ideal for fine or damaged hair. The result is very natural looking and lasts for months. But the application can take hours and every 2-3 months, you may need to have your extensions repositioned as your natural hair grows in. This is also the costliest method. Traditional heat fusion using a flatiron and glue can be damaging to hair. If you remove the extensions, you may be left with damaged hair. These cost $1000 and up. With more hair on your head, the extensions can feel warm and can take much longer to shampoo, condition, detangle, air dry, blow dry and style than if you just had natural hair. This can be a pain for people who exercise a lot. With tape-in extensions, the stylist tapes a weft of hair (typically a longer section than the extensions used in the bonding methods) to the roots of your natural hair. To keep hair from matting, it's important to sleep in a loose braid or ponytail. These are great for fine or blonde hair because the tape is barely visible. The tape method can last up to 2 months. Because they tend to matte, you have to be diligent about brushing your hair a few times a day. Caring for, and styling, hair can be time-consuming. Hair will shed. Sewn-in extensions are commonly referred to as "weaves" and are very popular with black women. Hair is basically sewn into cornrows made of natural hair. As long as the cornrows are not too tight and you take care of your hair, by shampooing and conditioning weekly, your sewn-in extensions can last up to 8 weeks. The process can be expensive, costing up to $1,000. With micro rings extensions, the weave is attached to the natural hair using small aluminum rings lined with silicone. The rings are so tiny, they are usually not visible. Because they don't use heat or adhesives, this method is considered to be less damaging to natural hair. But they need re-positioning every 2-3 months as hair grows in. Now that you know the different types of hair extensions, perhaps it's time to take the plunge. Want to Switch Your Look Up? Try a Weave.